The time has come for a more practical approach to training. An approach that allows both new and learners with existing skills to gain valuable hands-on experience. An approach that is affordable for strapped school districts, college’s and corporate training centers. An approach that allows mobility to learning, bringing training equipment to the learner wherever they may be. The time has come for Mobile Modular Training Systems. Our practical approach utilizes industry-standard components, designed to simulate industrial systems that are modular and offer connectivity with infinite opportunities for continued learning to close the skills gap. Complete mobility of critical “hands-on” training regardless of location. Any available space instantly becomes a training location. Affordability for financially strapped school districts, colleges and industry. Our units are modular, and grow and connect as needs change providing a solid financial investment both now and for the future. Ultimate flexibility on when training takes place. Grab your learners, find a space to sit, and your training units and curriculum are ready to go immediately. Our training units provide hands-on, self-paced or instructor-led training in critical areas of workforce demand. Proven, successful curriculum is included for every trainer for classroom, one on one, online or self-paced training programs. Flexibility to integrate into existing curriculum and training systems in a variety of industry applications. Industry-standard components bring all the benefits of mobility, connectivity and cost savings to any training program. Our exclusive design allows for complete mobility (train where you want), connectivity (mobile units connect to provide additional expanded training), and racking (storage racks hold multiple units for convenient transport and storage). Our Automation Trainer provides curriculum and instruction so learners will be able to design, install, and maintain electronic equipment used in modern industrial processes and work on a wide range of control systems. Learners will learn the fundamental concepts to safely design machine systems and wiring as well as an introduction to automation control components. The Control Devices Trainer provides curriculum and instruction to learn the concepts of various industrial control devices as well as when and where to use them. The Pneumatics Trainer provides curriculum and instruction to the forces of fluid power, including force multiplication, work, energy and power. Learn the fundamental concepts of hydraulic and pneumatic systems for maintenance individuals in the manufacturing environment..
Our VFD (Variable Frequency Drive Trainer) provides curriculum and instruction to learn variable frequency drive operation, how to diagnose and troubleshoot problems with VFD circuit failures and industrial drives technology. The Allen-Bradley Compact Logix PLC (Programmable Logic Controller) Trainer provides curriculum and instruction to learn the fundamental concepts of Industrial PLC from identification of hardware components through programming from functional specification. This trainer utilizes Rockwell Automation “Studio 5000” programming software. 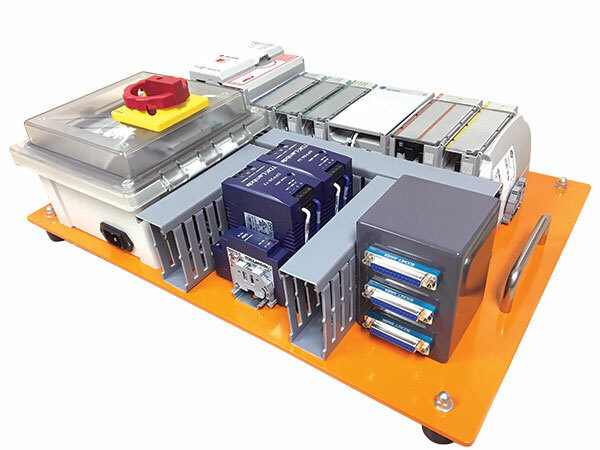 The Servo Trainer provides curriculum and instruction for components and operational functions of servo systems. Learn the applications and utilization of digital input and output devices through connection to and programming PLC’s to complete basic motion tasks. The Allen-Bradley Control Logix PLC (Programmable Logic Controller) Trainer provides curriculum and instruction to learn the fundamental concepts of Industrial PLC from identification of hardware components through programming from functional specification. The HMI (Human Machine Interface) Trainer allows you to learn to safely connect and control various trainers. Continued growth of automation and control systems has created a demand for people to design, install and maintain these systems like history has never seen before. The Allen-Bradley Micro Logix PLC (Programmable Logic Controller) Trainer provides curriculum and instruction to learn the fundamental concepts of Industrial PLC from identification of hardware components through programming from functional specification. This trainer utilizes Rockwell Automation “Connected Components Workbench” programming software. To learn more about our industry, capabilities, and curriculum solutions visit our Curriculum page. To find pricing and availability information, to request a quote, or to schedule a visit to our showroom contact our sales department.